An early 1900s American motel located near what is now Arney’s Marina that was built as a tree house??? We couldn’t make this up. 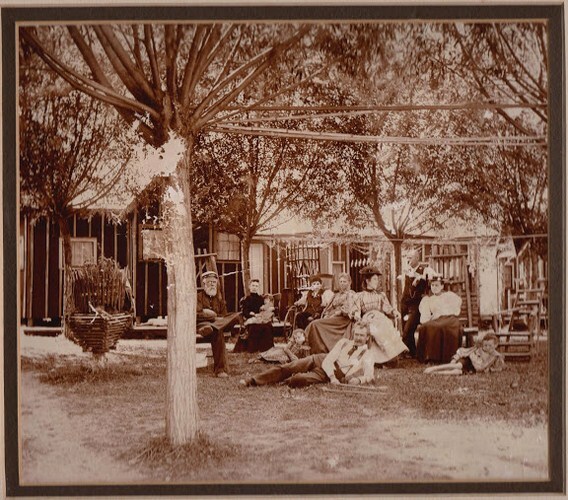 Read on about one of the earliest and most unique motels in the United States…. Deborah L. Hopkins tells the interesting story of an ancestor…. Benjamin (Ben) was born in Sodus NY on July 17, 1834. His parents were Stephen and Sarah (Kent) Hopkins. He had the following siblings: Townley E. (Effingham), Susan R., Hannah M. (Pulver), Harriet (Pulman), Stephen Nelson (“Nelson”), and William. Ben was a well known sailor and ship’s captain, sailing the Great Lakes for some 25 years. He married Ruth B. Sheppardson. They had a daughter who died in infancy in June, 1856 and was buried in Busnell’s Burial Place, Sodus NY. Ruth then bore 3 sons; Frank, Fred Townley and Byron Allen. Ben learned the feed and flour milling business from his father Stephen. Stephen had built a mill in what was then called Christian Holler. In 1865 Ben built a gigantic feed and flour mill on Mill Street in Sodus. There is a great photo of it in the scrapbook that shows how large an operation it was. The mill was run in that location until the early 1900’s, when a new one was built further south on Mill St. The newer mill still exists and it owned by a church. Their home was in front of the mill. There is a funny newspaper article about the painting of the house and mill in the file. He must have been quite a character according to the story. Sometime after the children were teenagers, Ruth left Ben and moved to Nebraska. (See her biography). Ben was known to be a womanizer. She took her son Frank, the oldest. Ben continued to raise the two sons Fred and Byron. In several Census records, it is noted that he had a “housekeeper” and those women helped to finish raising the boys. One in particular, Harriet (Hattie) Bird, and her invalid son Floyd, lived with Ben for many years. At some point, Ben built a unique tourist business known as “Santiago de Sodus Point” on the west shore of Sodus Bay. He evidently constructed the buildings himself. 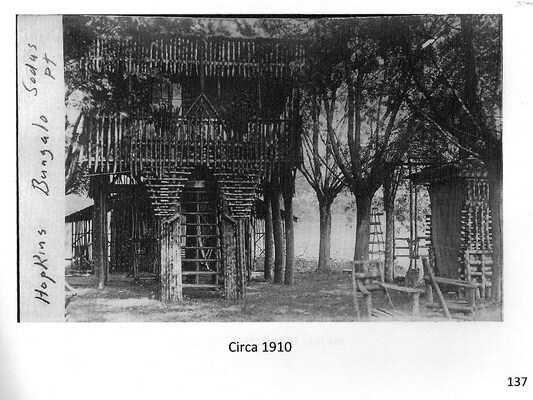 It consisted of several buildings, one or two of which were bedrooms built in the trees! It could be called one of the first motels in the US, as rooms were rented and you could also eat at the establishment. It was probably known as a boarding house in those days. Ben would take his horse and wagon to Sodus and pick up the customers who would come over from Rochester for the day or weekend. It was quite a creative complex as a large family photo indicates. There are also several smaller photos of the property, one of which was a birthday party for his grandson, my father, Stephen Nelson Hopkins, taken in the 1920’s. I am not certain, but believe that the site was later the site of the “cottage” and he may have built both. The later photos of the cottage are also in a scrapbook. They were taken in the 1920’s. As a child, I was fortunate enough to have gone to the cottage with my parents and remember some of it vividly. Every spring the front yard would flood from the Bay and you would have to walk into the house over planks laid on the ground. I recall distinctly a round concrete slab with a ship’s anchor set in it. I have photos of “Santiago” that also show the anchor, which leads me to believe the property had both “Santiago” and the cottage on it. Ben also had some connection with a historic property known as “The Shaker Tract” of which much has been written. (See “Wikipedia” if it still exists when you read this!). It was originally owned by a religious sect known as Shakers. It was later sold, then inherited, in part, by a long time friend of Byron’s, named Frederick Chamberlain. They made several trips to Europe and some islands together. There were several houses on the property and I have a suspicion that Ben owned one of them. There are several family photos in scrapbooks showing the family outdoors in a field of daisies. The building in the background may be one of the houses on the Shaker Tract. I do not know the facts at this point, and can only speculate. In Ben’s obituary it states that he was working on the Tract the day before he died. I have copied a description and map of the Tract for reference. Perhaps someone in the future can research this and find an answer to the mystery! I wanted to mention Ben’s siblings. They were probably important to him. Effingham Townley was born in 1819 and was known as “Tommy” or “Townley”, but not Effingham. He was a hunter, as most men were in those days. He was a carpenter and mason by trade. He was a lifelong resident of Sodus and married three times. By 1910 he was living with a family named Collins, was a widow (his third wife died in 1905) and was perhaps blind. He died in 1911 at age 92. See more information in his biography. Ben’s sister Susan was born in about 1829 or 1835 (Census), never married and lived in Sodus in 1860, according to the Census. In the 1900 Census she was living with her brother Nelson in Ramapo Township, NY. Stephen Nelson (Nelson) seems to have moved to Ramapo Township and was married to Elizabeth H. He was a farmer. I believe Elizabeth was baptized in August 1845, and she died on March 16, 1846. I am not certain, as there were several Elizabeth’s in the family. If the date fits mathematically, then it meant this Elizabeth. In later years he moved to Spring Valley NY. I have two photos of him, one as a young man and the other taken on his 78th (?) birthday! He wrote in pencil on the back and it is now very faded. Ben’s sister Hannah M. married Harry M. Pulver and they lived in Sodus. By the 1910 Census she was a widow. I know nothing else at this time. Harriet married Alonzo H. Pullman and they had two children; Edward and Mary. She died at age 29, leaving him to raise their young children, along with his mother Anna and sister Laura, who were living with the couple before Harriet died. Alonzo was a farmer. William was married to Eliza Ann. He died Nov. 25, 1905. Perhaps he was a farmer. Ben passed away on Nov. 25 or 26, 1905. According to one obituary, he had been working on the “Shaker Tract” for several weeks before he became ill. He probably died of some sort of heart problem. He was 71years old. One photo exists; the large photo of him at Santiago, with several others. It may have been taken about 1900, based on grandson George’s physical size at the time of the photo. We, the undersigned, having discontinued the boarding house business on the “South Shore” of Great Sodus Bay, known as “Santiago” and located ten minutes walk from Margaretta Grove, where all trolley cars stop, wish to announce that we will sell at a public auction, on Tuesday, December 19th, beginning at 11 a.m., sharp, the following property: – 6 Row Boats, 20 Chairs, 10 Beds, Sewing Machine, Several Commodes, Wash Bowls and Pitchers, Lamps, Matting, Pictures, Mirrors, Shovels, Hoes, and Carpenter Tool, Large Cooler suitable for hotel or restaurant (nearly new), Pony, Harness, Cart, Cutter, Sleigh, pair Coasters, Work Bench, Covered Carriage, 2 horse power Gasoline Engine suitable for launch, Sixteen Buildings. These buildings are arranged to be moved at a small expense and can be moved on the ice to any part of the bay. The Masonic chair that was made by the late B. A. Hopkins, and which has been admired by hundreds of people because of its workmanship and Masonic emblems, was brought up from Santiago, on Sodus Bay on Tuesday and at a meeting of Sodus Lodge F. & A.M., last evening, it was presented by the sons of Mr. Hopkins to the lodge of which their father was so long a member.